Talk about your wierd looking insects. 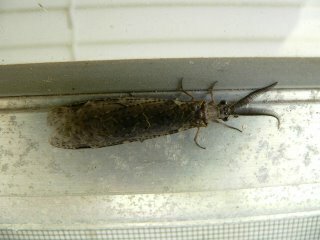 I photographed this 2 1/4" Summer Fishfly (Chauliodes pectinicornis) on my window near the porch light. 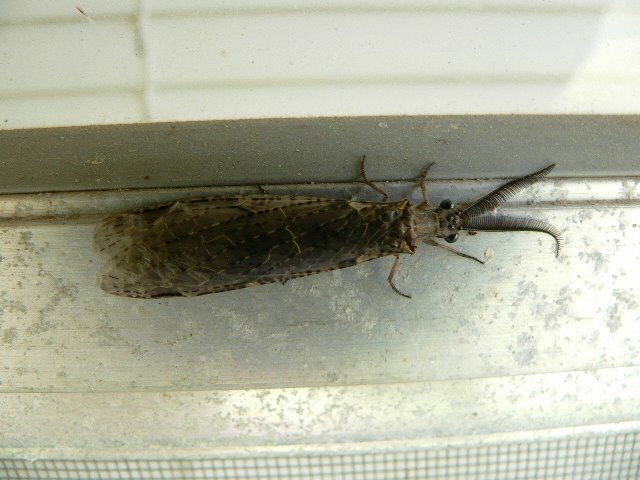 It closely resembles its cousin the Dobsonfly, without the powerful jaws. Its wings cover most of its elongated body and has feathery, comb shaped or "pectinate" antennae in between its dark, beady eyes. Adults are poor fliers and during their short life span their sole responsibility is to mate and lay eggs. They lay their reddish brown, oval eggs on vegetation or rocks near still bodies of water where the larva hatch and crawl or fall into the water. This insect lives most of its life in the larval stage, and is carnivorous feeding on minnows, tadpoles, and aquatic insects. They are a pollution sensitive organism and are used to monitor the health of streams. Larva eventually leave the water in search of rotted logs where they pupate for ten days emerging as adults. Amazing what a simple porch light will attract. I just photographed one of these yesterday in my yard in Portsmouth, NH. My wife found it on our shed and brought in inside. We took it back outside and put it on a tree branch, and it folded its wings around the branch so that it blended in very well. I had no idea what it was and I was happy to find this post. thanx for the comment jeremy. These bugs are really creepy looking and when I found the one I photographed I was ecstatic. Always cool to come across something out of the ordinary.